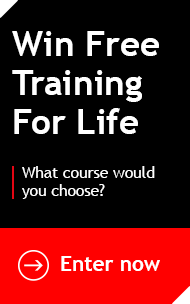 Firebrand re-launched its Free Training For Life competition, giving you the chance to get free access to all the Firebrand training courses for the rest of your life. Will you be the winner of the £1 million prize? View the competition’s details and give yourself a chance to win! If you’re the lucky winner, you’ll be able to choose from Firebrand’s 165+ training courses. Whether you’re a networking professional, an enterprise architect or a security professional, there are plenty of courses, which will help you to get better in your field of expertise. Never want to pay for training again? Enter by clicking the button below. Once you've filled out the entry form, you will be given your unique URL which you can share with your friends and followers. Every time someone enters using your unique URL, it will earn you an extra entry to the draw. So if 10 people enter that's 10 extra entries, if a 100 people enter, that's a 100 extra entries and so on. Don't wait any longer, message your friends, put it on social media or maybe even put it on your blog if you write one.